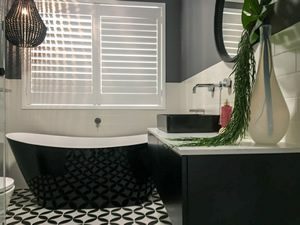 Master Bathrooms & Kitchens is a family owned and run company based in Castle Hill that has been performing bathroom renovations and kitchen renovations in the Hills District, Hornsby Shire and North Shore for over 20 years. Fred Mannah (owner) has been in the bathroom and kitchen renovating industry for more than 30 years. Bathrooms and Kitchens are not only his expertise but his passion. All jobs are quoted, measured and designed by Fred and completely under his supervision from start to finish. We offer a full service from design, plan, assisting in selections right through to supply and renovation. Our team of tradesmen and suppliers have been working together for over 20 years. With an average of 100 bathrooms and kitchens per year, we have a system that is tried and true and ensures a perfect job every time. We at Master Bathrooms & Kitchens pride ourselves on our good reputation and use only quality products and materials so that we can ensure a job well done, quickly and efficiently with as little disruption to your household as possible. All work is carried out by our team of qualified licensed tradesmen and all work is guaranteed as stipulated by NSW Office of Fair Trading. Master Bathrooms & Kitchens carries all relevant insurances and is approved for Home Owners Warranty insurance. Expert Bathroom & Kitchen Renovations in the Hills District, Hornsby Shire and North Shore.